This is a completely original Nativity scene created by Puerto Rico’s first certified Polymer Clay Artesean: Belen del Nido. 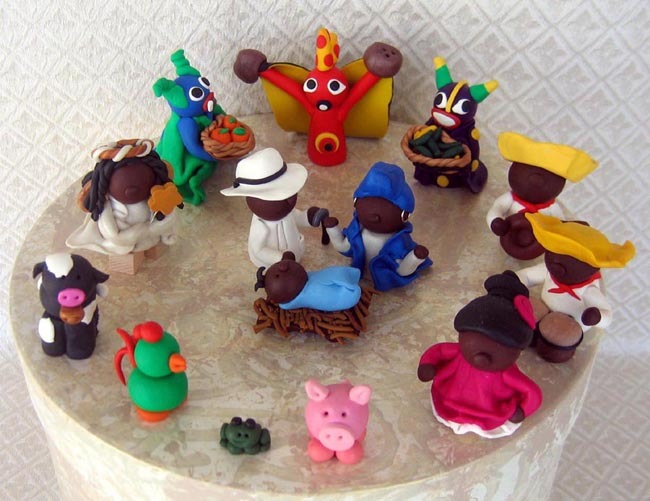 Inspired by Puerto Rico’s rich and colorful culture, you will not find another Nativity scene like this anywhere! Each piece is hand-molded in polymer clay and is signed by the artist. The tallest piece measure about 3 inches. Mary: dressed in “Campesina” clothes w/ blue handkerchief tied on her head and large loop earrings. Joseph: dressed in his best white guayabera with a white fedora hat and holds a cane. Jesus: swaddled in blue blanket and lays on a little wooden crib. The shepherds are actually Bomba y Plena dancers (typical Puertorrican dance). These include a guitar and bongo drum players dressed in typical white outfits with red handkerchief tied around their necks and a beautiful dancing bailerina with flowing skirts and a pink rose in her hair. The 3 wise men are 3 Vejigantes (Puertorrican mythical creatures) who bring coconuts, oranges and platanos for the celebration. An Angel with long black curls and dressed in white robes carries the star of Bethlehem. The rooster, cow, pig and little coqui (small tree frog found only in Puerto Rico) look on.